As the highest-profile advocate of Idaho, Gov. C.L. "Butch" Otter is accustomed to enumerating the state's attributes. And although the economic doldrums are being felt as much here as anywhere, the governor—whether through personality, conviction or public relations—exudes optimism about Idaho's future. In an interview with the Idaho Mountain Express during the Allen & Co. retreat in Sun Valley last week, Otter ticked through the reasons why Idahoans should share his predilection for the positive. 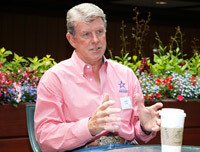 "Idaho is ... positioned to come out of this economy in really great shape," he said. Indicators for a bright future, he said, include higher revenues than projected, an upgraded bond rating this April from Standard & Poor's rating agency, a balanced budget and a well-funded pension program. Achieving those objectives has not pleased everyone. A controversial school-reform package, slashes to social services and no appetite for raising taxes, even on items such as cigarettes, exasperated the Democratic side of the aisle during the 2011 Legislative session and prompted a lawsuit from the statewide the teachers' union in spring. Additionally, much of the projected state revenue is already spoken for, so the state budget surplus may end up being only $6.6 million for fiscal year 2012, according to a report released last month by the Idaho Division of Financial Management. Almost all of that remainder will be directed to education. But Otter continues to defend his convictions and the path Idaho is on. Part of the governor's plan for revenue growth and economic development is Project 60, an initiative that aims to increase Idaho's gross domestic product to $60 billion per year from the current $54.5 billion. Otter said this will bring in more tax revenue while keeping the tax rate the same. In other words, the state can grow its way to increased revenue rather than raise taxes. To get there, the state departments of commerce and labor, along with private companies, are seeking to retain and expand established businesses, recruit new companies, and pitch Idaho's offerings to a domestic and international audience. "We've got 125 principles in the pipeline," Otter said. The "principles" are companies looking for sites in Idaho to start or grow their businesses. The recruitment sales pitch includes statewide attributes such as inexpensive power, workforce development through partnerships with educational institutions, an intelligent workforce with a good work ethic, and a high quality of life. Mining, timber and agriculture are what most people think of when they think of Idaho. The state's reliance on natural resources has provided decades of economic activity. Increasingly, other sectors such as recreation and tourism are coming into the equation. Otter acknowledges an expanding economic base that still counts on Idaho's traditional industries. "They haven't gotten less important so much as high-tech and tourism have increased their size in the economy," he said. Idaho's approximately $3 billion tourism industry kicks back hundreds of thousands of dollars in tax revenue to local communities. Visitors pay the state's 6 percent sales tax, plus a 2 percent bed tax—a dedicated funding source used to promote tourism—as well as local option taxes in cities such as Sun Valley, Ketchum and Hailey. Otter places a high value on tourists' contribution to the state. "Those are the most appreciated dollars," he said. Money from visitors is injected into the economy without the same level of infrastructure that residential growth demands, so the return on investment in tourism is high, he said. Although tourism, like many sectors of the state and local economy, has taken a hit during the recession, Otter said there is enough movement in the right direction to warrant cautious optimism. "I think this economy has bottomed out," Otter said, "and is beginning to show some signs of improvement."